Happy Wednesday! 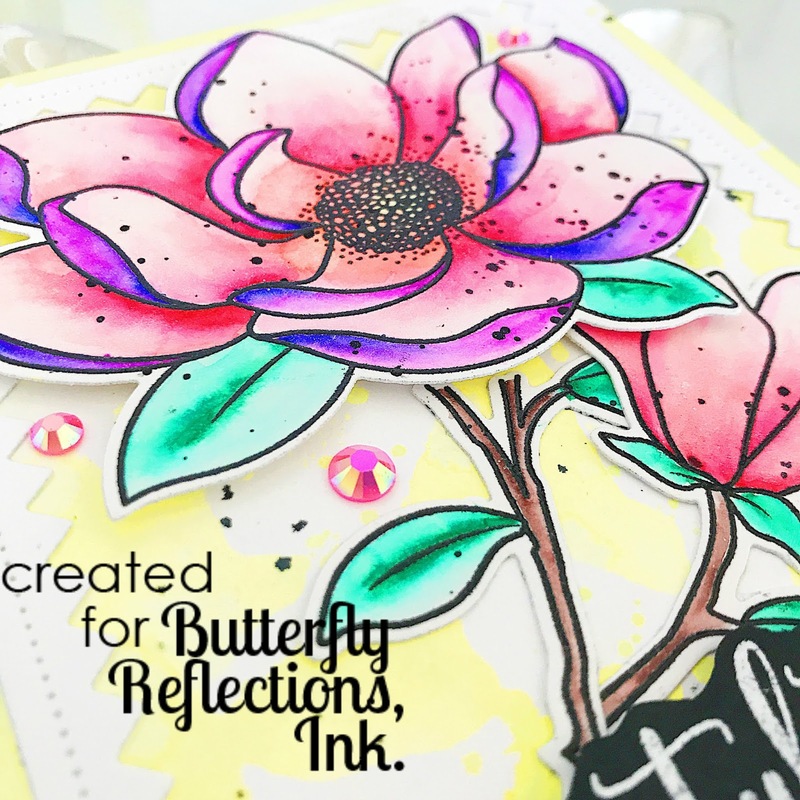 Lindsay here on the Butterfly Reflections Ink blog using new Avery Elle products from their latest release. The whole release is available on the Butterfly Reflections Ink Store and I highly recommend checking it out. Today, I'm sharing two cards using the Avery Elle Magnolia Stamp Set. The first, shown below, is a bright, bold card. It was created for my cousin who recently graduated from NYU. I started with stamping the Magnolia Stamps onto Bristol Smooth Cardstock using Versafine Onyx Black Ink with my Mini Misti. I then heat embossed the image with Hero Arts Ultra Fine Clear Embossing Powder. Once that was finishing, I took out my Clean Color Real Brush Markers from Kuretake Zig and got to coloring! I really have to say that coloring with Zigs on Bristol Smooth Paper is one of my favorite things right now. 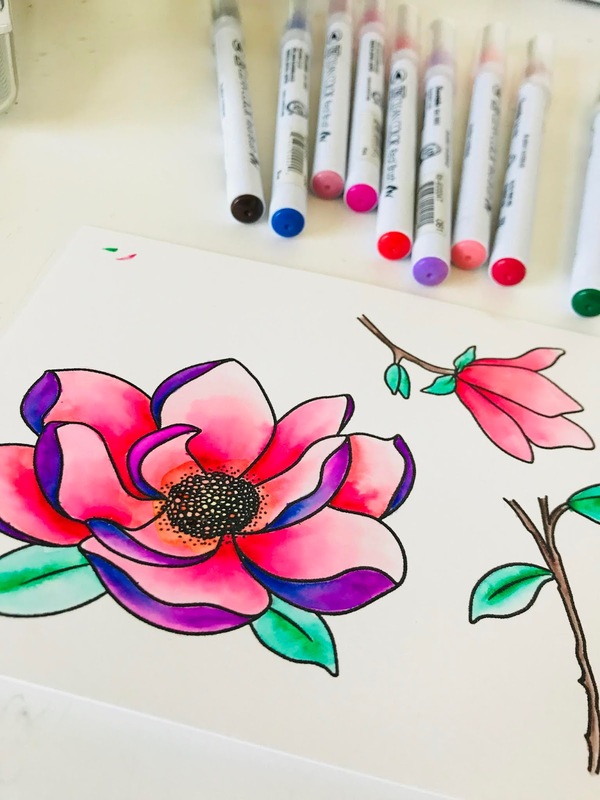 It's so fun and easy to blend out the colors are they are all so vibrant (and vibrant colors are kind of my jam). 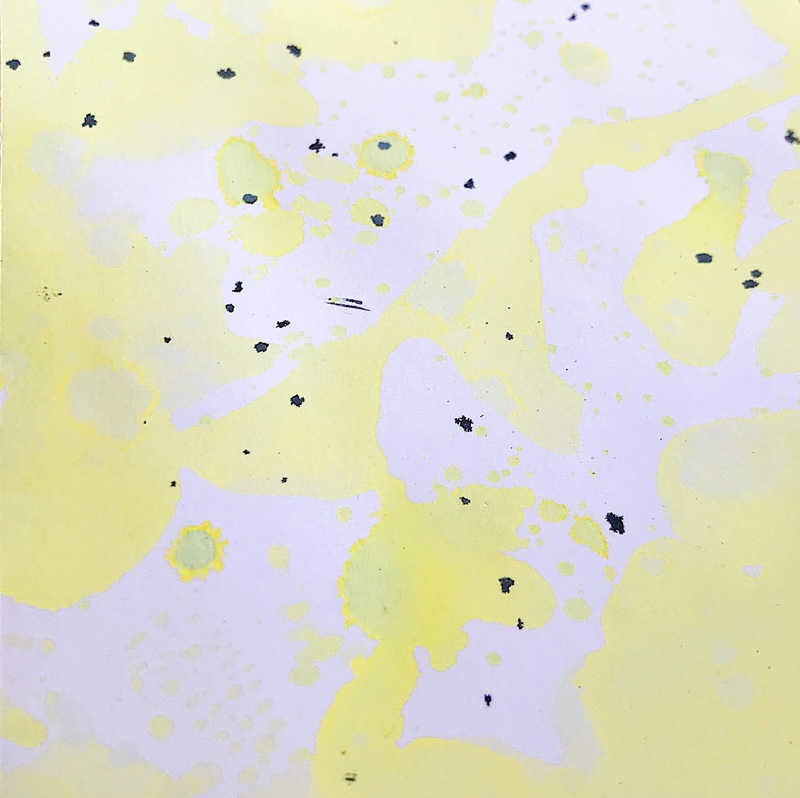 After letting the coloring dry on its own and black splattering the images using Black Soot Distress Oxide Ink, I used the Magnolia Coordinating Elle-ments Dies to cut out the images. Coordinating dies are a life saver for me as I really dislike fussy cutting. 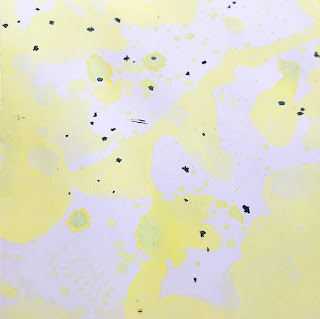 I then used the ink smoothing technique with Squeezed Lemonade Distress Oxide Ink to make a subtle, yet bright and summery background. I again used Black Soot Distress Ink to splatter some black dots on the background. I can't seem to stop splattering things! I placed the largest frame from Avery Elle Reversed Pinked Elle-Ments onto the ink smoothed background. I definitely think one can't get enough frame dies! 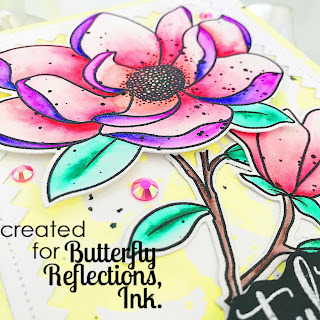 It's a great way to add a decorative element to a card. 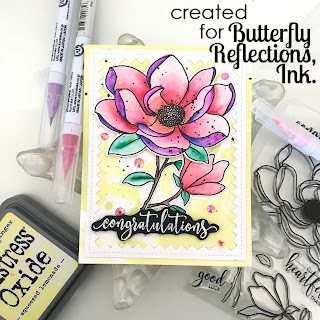 I then heat embossed a sentiment from the Magnolia Stamp Set onto black card stock using Versamark Ink and Hero Arts White Embossing Powder. I then fussy cut out the sentiment to allow for more of the pretty flowers and background to show. As you should already know, I finished off the card with Pretty Pink Posh Watermelon Jewels using Multi Medium Matte with a precision tip. And that's the end of my first card! Here is my second card, a bonus for today's posting! 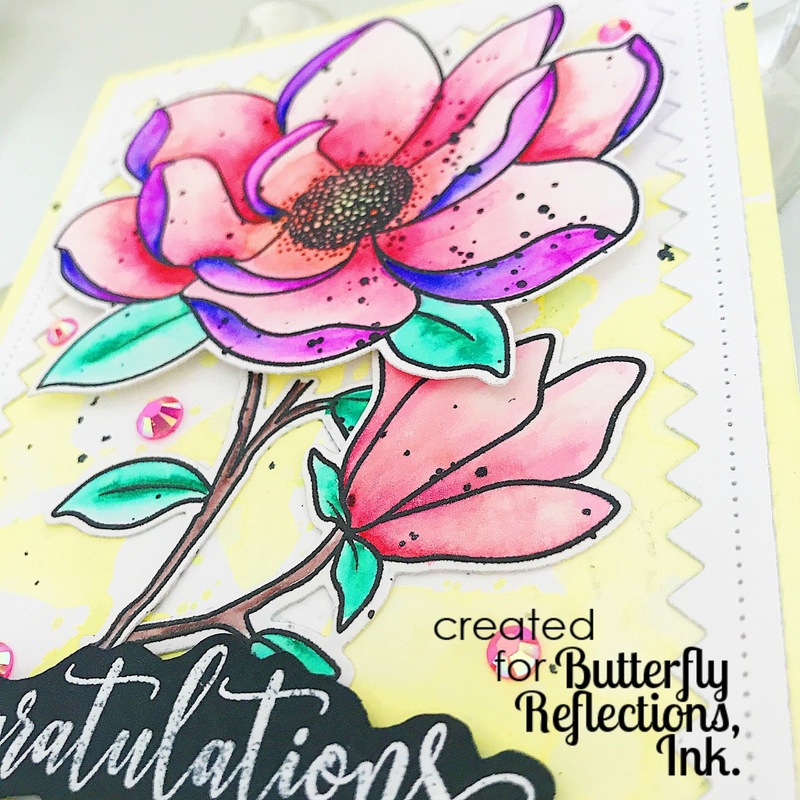 I had some backgrounds left over from playing with Distress Micro Glaze so I decided to use them with the beautiful Magnolia Stamp. I used the glaze over Distress Oxide Ink that was ink smooshed on to Alcohol Ink Paper. WHAT A FUN TECHNIQUE! I used White Embossing Powder to stamp the images onto these backgrounds and cut out with the Coordinating Dies. 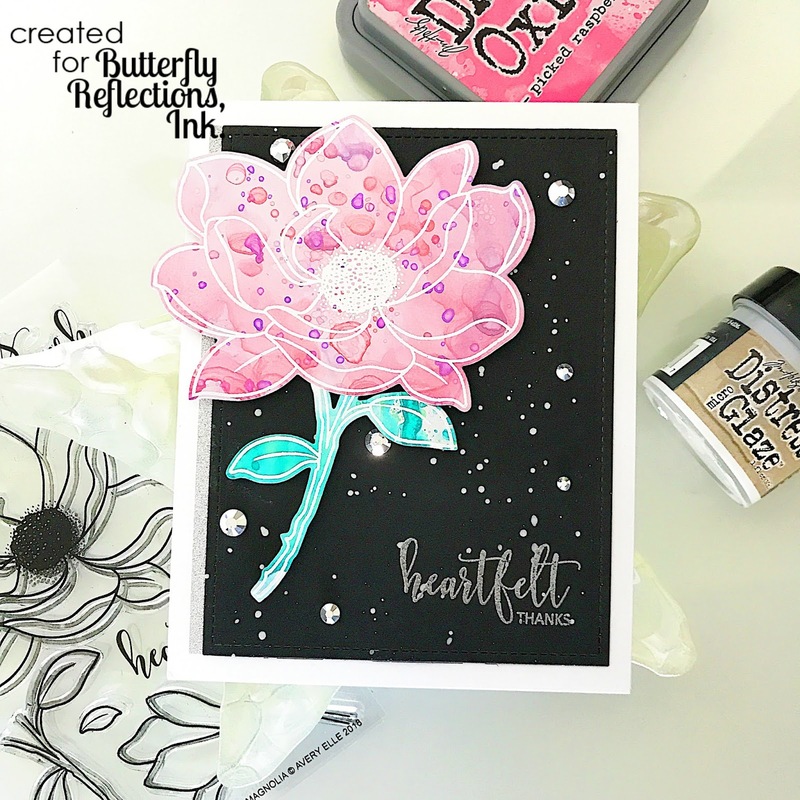 The black background is splattered with Gansai Tambi Starry Watercolors and embellished with Metallic Jewels from Pretty Pink Posh. The sentiment is heat embossed with Silver Embossing Powder. Thanks for stopping by today! I'll be on the blog again on Saturday!